The White House Has Working WiFi! In the nearly 7 years I’ve lived and worked in Washington, finding working wifi has been a constant battle around the District. Yesterday, I was astonished and elated to find a working, robust wireless network operating in the basement of the Eisenhower Executive Office Building at the White House. This shouldn’t be that exciting in 2016, but it was, and remains so, particularly in the basement theater that’s a deadzone for cell phones. I’ve gotten online there in past years but rarely without difficulty or disruption. 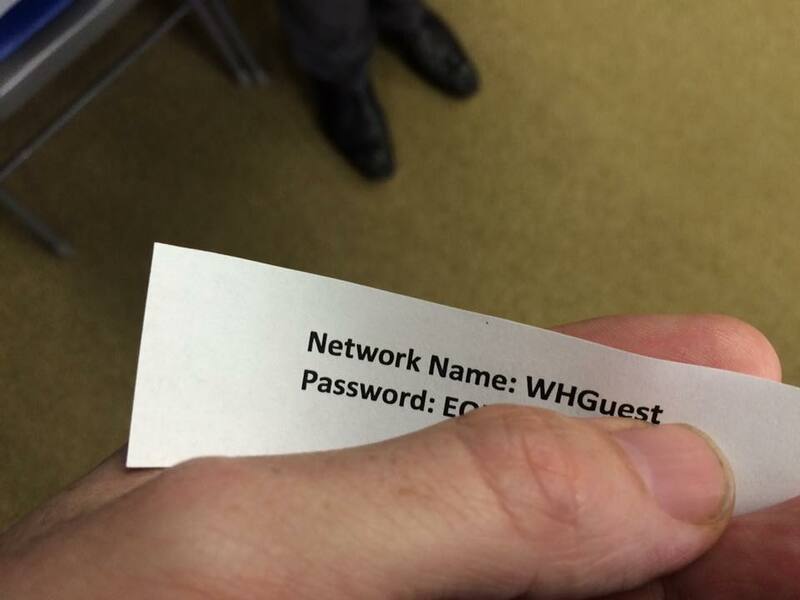 Functional White House wifi enabled the people at the forum I attended to get online to share what they were experiencing, including participating in the online backchannel on Twitter and uploading selfies. This was the first time I’ve been asked to take a selfie with strangers at the White House. As precedents go, it’s not earthshaking, but it’s an interesting reflection of our wired moment. It’s taken the Obama administration most of two terms to upgrade this aspect of White House’s IT infrastructure — when staff showed up in 2009, they found computers still running Windows 98 — but they’re leaving the place better than they found it. My favorite public place to log onto a public wireless network, however, still remains the House Public network in “the People’s House” in the Rayburn Office Building. Creative anti-#sopa activism in the wifi options in the hearing overflow room. Tomorrow, President Barack Obama will be answering questions about housing during a live event with Zillow. Today, President Obama went directly to Instagram to ask the American people for questions about housing. In some ways, this is old hat. The source for the questions, after all, is the same as it has been many times over the past five years: social media. As I commented on Tumblr, five years into this administration, it would be easy to let these sorts of new media milestones at the White House go unremarked. That would be a mistake. 1) The White House is encouraging people to ask the president questions using the #AskObamaHousing hashtag on Twitter, Zillow’s Facebook page or with their own “instavideo” on Instagram. 2) It’s being hosted by Yahoo! and Zillow, a online real estate market place that has been a prominent supporter of the administration’s open data efforts. Such informal, atomized mobile videos are now a growing part of the landscape for government and technology, particularly in an age when the people formerly known as the audience have more options to tune in or tune out of broadcast programming. If the White House is looking to engage younger Americans in a conversation about, Instagram is an obvious place to turn. Today, politicians and government officials need to go where the People are. Delivering effective answers to their questions regarding affordable housing in a tough economy will be harder, however, than filming a 15 second short. Are online petitions the next step in e-democracy or an e-exercise in futility? At noon today, I’m going to be on the Kojo Nnamdi Show on WAMU, DC’s local NPR station, to talk about the power of online petitions. What do you think of them, in general? Have you signed one or more? Why? What outcomes have petitions created at Avaaz or Change.org had? What about White House e-petitions? What about e-petitions in the UK or in other countries? If you have comments on these questions or relevant research, please let me know in the comments or email me at alex [at] oreilly.com. 1. Jim Snider, White House’s ‘We The People’ Petitions Find Mixed Success, NPR’s All Things Considered, January 3, 2013. 3. Jim Snider: The White House’s We The People Petition Website: First Year Report Card, Huffington Post, September 23, 2012. 4. Jim Snider: The Case of the Missing White House Petitions, Huffington Post, October 31, 2011. 5. Nick Judd: Is the White House doing enough for We The People?, TechPresident, November 2, 2011. The official response from The White House to the epetition to create a Death Star is, in Internet terms, epic. By turns geeky, funny, informative about U.S. space programs, and unabashedly supportive of science and technology education, the response to a popular petition on the “We The People” e-petition platform instantly entered the annals of online government history this Friday night. 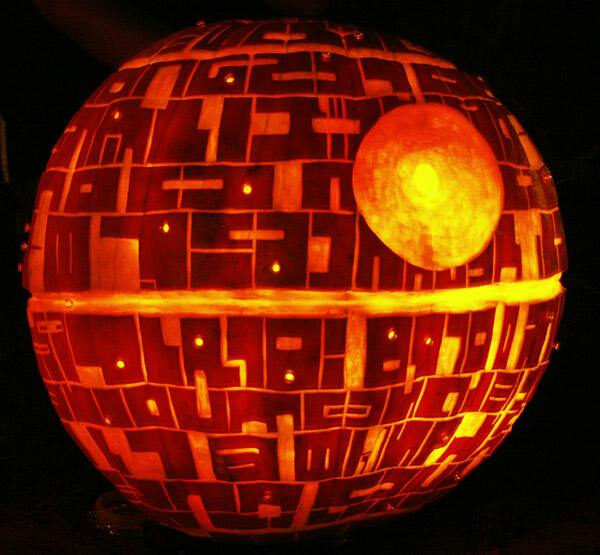 “The Administration shares your desire for job creation and a strong national defense, but a Death Star isn’t on the horizon,” wrote Paul Shawcross, Chief of the Science and Space Branch at the White House Office of Management and Budget. However, look carefully (here’s how) and you’ll notice something already floating in the sky — that’s no Moon, it’s a Space Station! Yes, we already have a giant, football field-sized International Space Station in orbit around the Earth that’s helping us learn how humans can live and thrive in space for long durations. The Space Station has six astronauts — American, Russian, and Canadian — living in it right now, conducting research, learning how to live and work in space over long periods of time, routinely welcoming visiting spacecraft and repairing onboard garbage mashers, etc. We’ve also got two robot science labs — one wielding a laser— roving around Mars, looking at whether life ever existed on the Red Planet. Keep in mind, space is no longer just government-only. Private American companies, through NASA’s Commercial Crew and Cargo Program Office (C3PO), are ferrying cargo — and soon, crew — to space for NASA, and are pursuing human missions to the Moon this decade. Even though the United States doesn’t have anything that can do the Kessel Run in less than 12 parsecs, we’ve got two spacecraft leaving the Solar System and we’re building a probe that will fly to the exterior layers of the Sun. We are discovering hundreds of new planets in other star systems and building a much more powerful successor to the Hubble Space Telescope that will see back to the early days of the universe. We are living in the future! Enjoy it. Or better yet, help build it by pursuing a career in a science, technology, engineering or math-related field. The President has held the first-ever White House science fairs and Astronomy Night on the South Lawn because he knows these domains are critical to our country’s future, and to ensuring the United States continues leading the world in doing big things. If you do pursue a career in a science, technology, engineering or math-related field, the Force will be with us! Remember, the Death Star’s power to destroy a planet, or even a whole star system, is insignificant next to the power of the Force. When White House director of digital strategy Macon Phillips replied to a tweeted question about an outstanding petition on open access, he proved his Star Wars bonafides with a echo of Yoda’s unusual grammar. This Star Wars fan is glad to have hilarity to share on The Kojo Nnamdi Show on the power of online epetitions on WAMU next Tuesday. 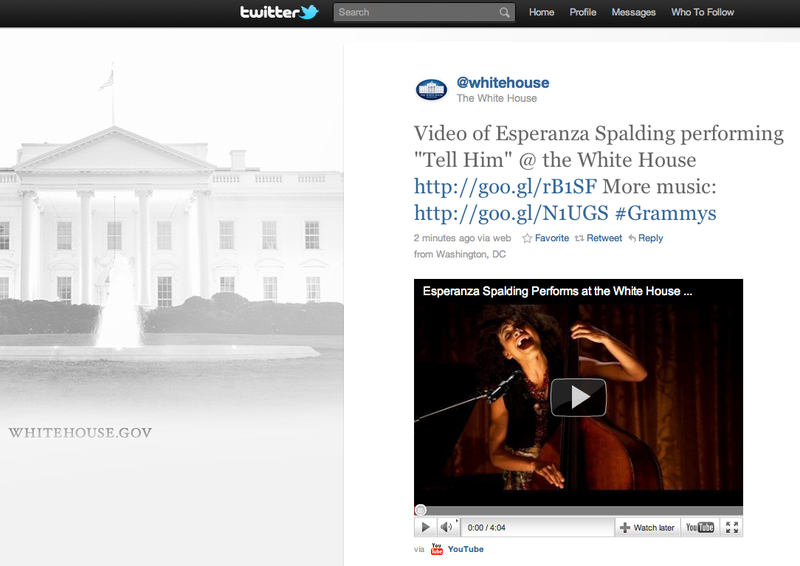 Shortly after that, the White House account shared the same video, along with a link to all of the performances on the White House YouTube channel. It’s good to know there are some music fans down the road at 1600 Pennsylvania Avenue. Congratulations to Spalding for the well-deserved recognition. How much has the online world changed in the past quarter of a century? In the years since Synbolics.com was registered, hundreds of millions of websites have followed that first domain name. According to the VeriSign Domain Name Industry Report, at the end of 2009 there were 192 million domain name registrations across all of the Top Level Domain Names (TLDs). Clinton was introduced by VeriSign president Mark McLaughlin as the “first Internet President,” a reasonable contention given the explosive growth of the online world during his terms in office. As McLaughlin pointed out, under Mr. Clinton Internet governance passed to ICANN and the first White House website. (For those interested, you can still hear Socks meow.) McLaughlin and others blogged about 25 years of .com on Facebook. Clinton made his comments on the day that the FCC’s National Broadband Plan was released, putting the question of how connectivity, innovation and speech should be stimulated (or regulated) into clear relief. Clinton suggested that access framework proposed by the FCC might be needed. Clinton talked about how the Internet has been indispensable to the work of his foundation. 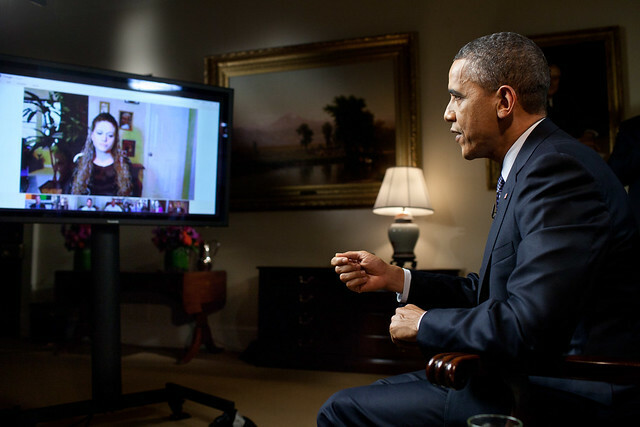 He also focused on the importance of information technology to his administration. When considering potential answers to that immense challenge, does the Internet have anything to do with solutions? One area where the Internet has proven its utility is enabling distributed fundraising. Clinton himself said that over half of donations made to victims of the Indonesian tsunami were made online. In 2010, Clinton said that MassiveGood.com, could a micropayment fundraising model where every time a consumer buys a plane ticket, reserves a hotel room or rents a car, they can choose to donate a small amount to AIDS, tuberculosis, malaria or childrens’ healthcare. “None of this would be conceivable without the Internet,” said Clinton. Clinton took some time to talk about both healthcare, the issue of the day, and climate change, perhaps the issue of the decade. “There are four countries which signed the Kyoto protocoal,” said Clinton: Denmark, Sweden, Germany and the UK. Clinton asserted that was because of the way that they consume and produce energy. ” A wealthy country has to have a new source of jobs every 5-8 years, he said. “The only way can be distributed is through the adequate use of IT. In the years ahead, we ought to do whatever we can increase access, compress time, improve connectivity.” ABC News’ Julie Percha reported more on Clinton’s talk at the Tech Forum, focusing on his remarks on healthcare. What is necessary to ensure open global access? “First of all, you can’t if nations disagree,” he said. “If they decide to control access, they have some ability to do it. Look at the role tech played at bringing to light what happened in the Iranian election.” Clinton suggested too that the audience consider the impact of cell phones in poor countries. “For every 10% increase of cellphone usage in poor countries, they gain .6% to GDP,” said Clinton, citing a recent mobile research report. The former President offered some insight into his use of technology during a question and answer with McLaughlin after his keynote. When asked what his three favorite websites were, Clinton chose political ones: Politico, the Huffington Post and FireDogLake. Clinton affirmed the substantive contributions that websites can make, although “don’t have to do what newspapers have to do every day,” as “some only have to have three serious articles a week.” Clinton said that he’s “worried about the ability to maintain any newspaper” in the years ahead.